The Portola Series is part of our custom line of cabinet stands available exclusively by special order. Available in a variety of finishes, the Portola Series is constructed of sold oak hardwood and oak veneers. This is a simple, clean, and understated design. The doors are flush mounted with magnetic touch latches. *Constucted of solid oak and oak veneers. 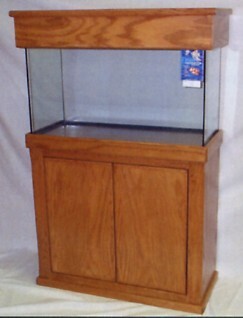 *Solid top deck with a built-in skirt to conceal the aquariums bottom frame. *Flush mount doors with touch latches.